The Wiksten Tank pattern is mega popular, and it’s easy to see why. Simple, fashionable, customisable and great for beginners. It doesn’t use a huge amount of fabric either, which makes it great for showing off precious fabrics or remnants. It’s been blogged about countless times already and you can see loads of lovely examples in the Wiksten Patterns Pool on Flickr. So far I’ve made three! All from fabric remaining from previous projects. The fabric in the version above was used before in my Sleeveless Floral Shirt. I adore this fabric and I’m sad it’s all gone now. 😦 My mum asked if it was Liberty, but no, just some bargain find in the department store! A cotton voile, light and airy and perfect for summer. The second version is made from the same woven viscose that I used in my Sureau. I was a bit short on fabric for this one, so the hem is straight instead of curved. Finally, (for now) I made a jersey version, from the remaining viscose jersey from my Floral Burda Dress. Even though this version is exactly the same size as the others, the weight and stretch of the jersey make the fit a lot looser. I made a few minor adjustments to the pattern. In the pic above you can see that I scooped out the armholes on the back sightly to give a hint of a racer back. I didn’t want it too pronounced though, just enough to cover bra straps. To achieve this, I had my design assistant (ahem, husband…) draw the outline of my bra straps on the muslin while I was wearing it – green lines below. 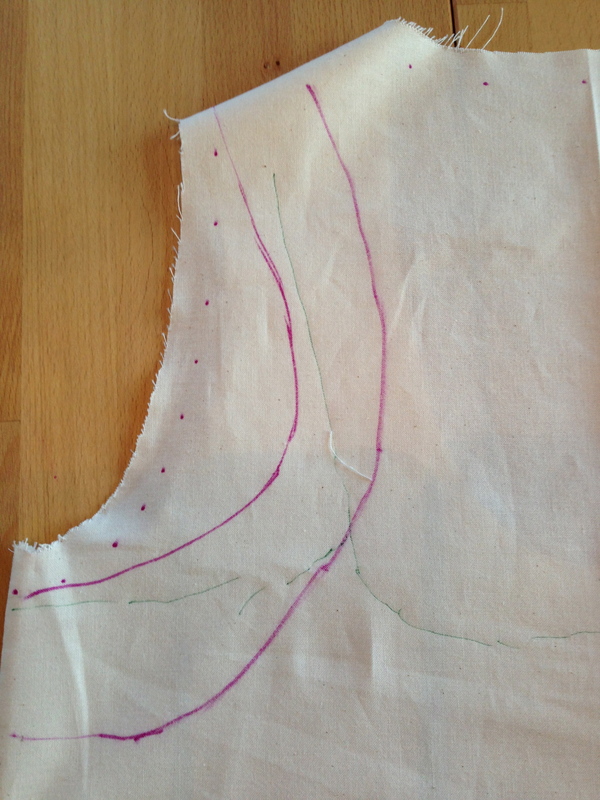 The inner / lower pink line is the outline of another top I own, which is too revealing, included for comparison. 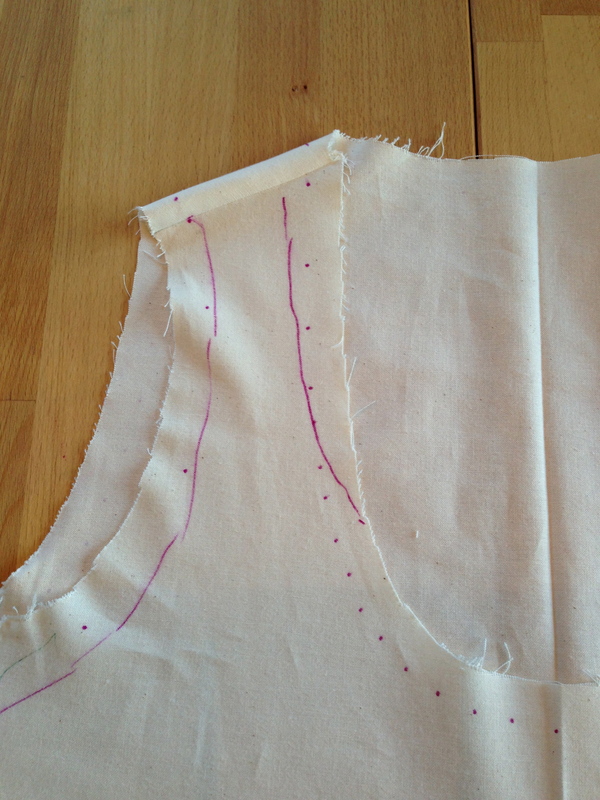 The outer / upper line is then where I sketched the new armhole that I wanted. I also scooped a little out of the back neck because I found it a little high, but it’s not drawn here. I brought the front armhole in a little too, as you can see below. I found the original neckline too low and ‘U-shaped’ for my taste, so I raised it and made it a bit more scoopy. I’m especially glad that I did this for the jersey version, because the weight of the fabric pulls even the revised neckline quite low. In terms of sizing, I originally cut the muslin in size M, but found it a bit too loose, particularly on the bust. The second muslin (shown below) in size S was way too tight, especially on the armholes and of course the bust! In the end, I used the size M, but took the bust in a little, but perhaps too much. It pulls a little across the chest in the woven fabrics. In contrast though, if I make another jersey version, I’ll do that in size S.
The above pic of the second muslin also shows my neckline workings. The cut neckline is my first revision, but it came out too high even discounting seam allowance. The purple lines are where I really want it to be. I was short of fabric for the jersey version above, so had to do the back in two pieces. It’s seamed somewhere below the bust line but with 100% zero intention, I think it is actually pretty imperceptible! Win! I really enjoyed making this pattern and will definitely make more. It was (shock!) my first time using french seams and since then, I have used them in everything! If you’re a beginner or advanced, I highly recommend this pattern. In just a few hours you get a lovely summery top! I’ve posted about all three over on Kollabora too, where I’ve included (with the Breezy Tank version) a little more detail on the alterations.